Our USB family keeps growing & growing! It’s our pleasure to announce one of our newest members of the USB family is Lisa Joines. She is a part-time Imaging Specialist at Elkton. 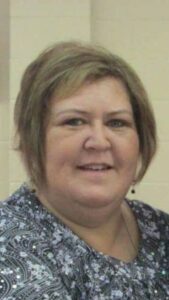 Lisa and her husband of 28 years, Glendle Sr., enjoy camping, fishing, tractor pulls and spending time with their two sons, their wives, and three beautiful granddaughters. They are also very active in their church. Please join me in welcoming Lisa to USB!